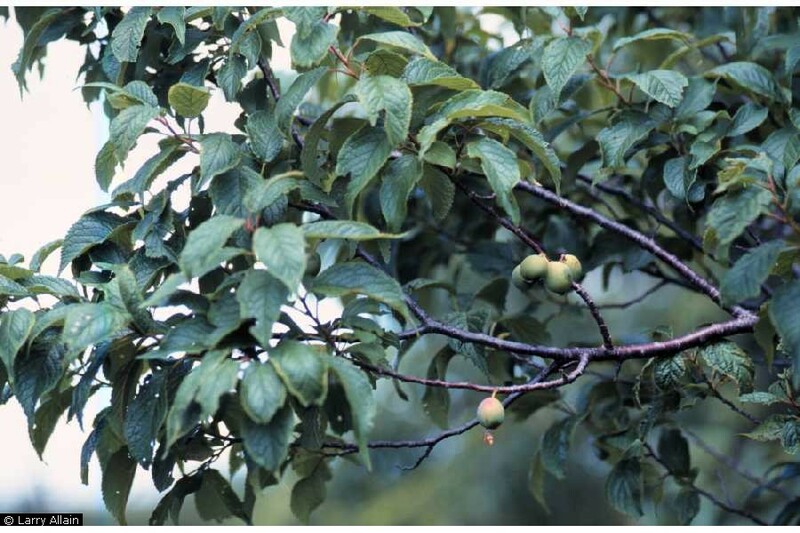 Prunus americana.Larry Allain, hosted by the USDA-NRCS PLANTS Database. (Accessed 9/2014). Prunus americana is a shrub or small tree to 8 m tall, colonial in thickets from root sprouts, trunks to 30 cm diameter, bark dark, twigs often with spines. Leaves alternate, widest above middle to 10 cm long, tip abruptly long-pointed, base pointed to blunt, usually hairy below, margin sharply, coarsely toothed, teeth to 0.2 cm long, tips often thickened, leaf stalks without glands. Flowers white to 1.5 cm wide, radially symmetrical, sepals often with toothed, tip, in clusters of 2-5 flowers; blooms April-May. Fruit fleshy, yellow-red, to 3 cm, plum-shaped, often with a waxy bloom, stone flattened, Aug-Sept. Eaten by birds and mammals (Martin et al. 1951). Notes: Attacked by black knot fungus (Apiosporina morbosa, Ascomycotina) and other common diseases of Prunus (See P. serotina). Fruits attacked by many insects.